The Boise State Broncos almost crashed the BCS party last year, but a narrow loss to Nevada relegated them to the Las Vegas Bowl. The Broncos dominated Utah in their bowl game to finish off an extremely successful 13-1 season. Despite the success, there is little doubt that many in and around the program were quite disappointed that they missed a real chance to get to the BCS Championship Game. Last year’s disappointment is behind them, and the Broncos still have a ridiculously talented roster for the year ahead. For a while it seemed that most college football fans saw Boise State as the small program that was a flash in the pan, but it has become quite obvious that Boise State is here to stay. Clearly, Boise State doesn’t have the difficult conference schedule that some of the major schools do, but this team has done everything asked of them. The Broncos just keep going about their business by winning and playing high-quality football. Chris Petersen has been the head coach at Boise State since 2006. To say that Petersen has been successful in this position is a major understatement. Boise State has gone 61-5 in Petersen’s first five years at the helm. He also became the first-ever two-time Paul “Bear” Bryant National Coach of the Year. Petersen is known as a great offensive mind. No one can forget him pulling out all the stops to beat Oklahoma in the 2007 Fiesta Bowl. Though he is an offensive genius, Petersen teaches accountability, and he follows a coaching pyramid that was started by the great John Wooden. Kellen Moore is back under center, which has to make Boise State fans extremely happy. Moore is absolutely a Heisman Trophy contender. He has put up some tremendous numbers in his career at Boise State. How good has Moore been the last two years? He has thrown 74 touchdowns and just nine interceptions in his last two seasons. Moore has thrown for at least 3,400 yards in all three of his years as a starter for the Broncos. The team will certainly miss Titus Young and Austin Pettis on the outside. The Broncos aren’t nearly as deep as last year at wide receiver, so that has to be a bit of a concern. While most people see this team as simply a passing team, the Broncos run the football very well. Doug Martin is a power runner who picks up tough yardage on a consistent basis. D.J. Harper could also be a huge contributor in the backfield if he can stay healthy. Harper is a shifty back who also has good hands. The offensive line has been strong for the past few years, and there is no reason to expect anything different in 2011. The Boise State defense hasn’t gotten nearly enough credit over the course of the last few years. Sure, the offense is terrific, but this defense is just as important to their constant success. The Broncos 2010 average of 259 yards allowed per game was good enough for fourth best in the country. It all starts up front, and this team is loaded on the defensive line again this year. Shea McClellin and Tyrone Crawford are talented senior defensive ends, and Chase Baker is a great run stuffer at the tackle spot. The secondary is still good, but they did lose their best player in Jeron Johnson. Ebenezer Makinde and Jeremy Ioane are both inexperienced, but they will be counted on to start right away. I expect both to be solid in the long run, but they might struggle a bit at the beginning of the season. The oddsmakers are expecting the Broncos to dominate their new conference, the Mountain West. Boise State is installed as a massive favorite at a price of -295 according to odds from 5Dimes. Could this be the year the Broncos actually win the BCS Championship? WagerWeb lists the Broncos at +1000 to win this year’s national title. Boise State’s biggest game of the year is likely their season opener in Atlanta against the Georgia Bulldogs. If they can win that game, the Broncos will be firmly in the BCS Championship battle. The Mountain West conference schedule is very kind to the Broncos this year. Boise State gets both TCU and Nevada at home. The trip to Fresno State could be a little tricky, but it’s hard to imagine the Bulldogs tripping up Boise State this year. Boise State’s favorable conference schedule has them in a position where they have a great chance to go unbeaten in the Mountain West. The Broncos may be a little short-handed at wide receiver, but they should be able to run the football against everyone they play. Kellen Moore will still have a big season, and the defense should be one of the best in the nation once again. 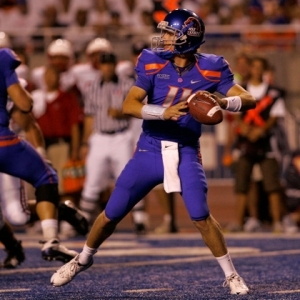 I think Boise State goes unbeaten in 2011.